There are many variables which can affect how quickly and easily property is let. Transport links, local schools and crime rates are the most common questions. And even broadband speed is now a factor! However, it’s the small things that are most often neglected by landlords.Any dated décor or shabby furnishings are an immediate turn-off to would-be renters. Spending a bit of cash on the interior can help achieve a greater yield in the long run. “There are many cases where we have strongly advised landlords to replace carpet and furniture or perhaps repaint the property in a more neutral colour,” says Ashley.“That’s especially true if they have been unhappy with the initial uptake when their property comes to the market. 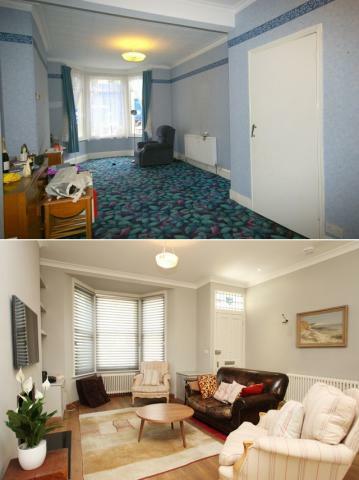 It really is amazing what a lick of paint can do when it comes to viewings in your property,” he adds.“The best example in all of my six years at Horton and Garton would be a house we sold in Carthew Road, Hammersmith, a few years ago (pictured left). ‘Dated’ would probably be the kindest way of describing the property, though luckily the buyer had enough vision to see past the interesting choice of carpet. He bought the property initially for his children to live in whilst studying, but also with a long term view to letting the property out in the future.“However, when the time came that the client wanted to let out the property, I have to say I feared we may have a struggle on our hands. The transformation left me astounded, however. Gone were the tired furnishings and décor of old – the house had been well and truly dragged into the 21st century.“Overall it was a great example of a savvy purchase. Firstly, seizing an opportunity in the right area and taking advantage of a rising market; secondly, having a long term view with regards to how to get a return on the investment; and thirdly, doing the necessary work to ensure the property was shown at the highest standard.”The property was rented with ease – largely because of the superb overhaul, giving any potential tenant the chance to easily imagine the house as their home. And this is also an important point to remember; small details such as removing personal memorabilia in preparation for viewings can make all the difference. Though it may not seem like much, any potential tenant needs to be able to imagine themselves living in the property if they are to consider making an offer. Even if that means stashing the family photos of Granny and Grandpa in a wardrobe temporarily!Once a good lick of paint has been applied, a thorough clean before you open the door to viewings is the final, and most essential, step. Paying the professionals is almost always money well spent – even if the house is brand new. Builders are not cleaners. But if you follow these top tips, you’ll certainly have a better chance of cleaning up.